This picture is taken at Källvikens Arabstuteri. He comes from the same mare family as Maz (his mother was a sister to Maz). He has competed in endurance and is the sire of the successful endurance horse Sarek. Martin belongs to the dam line of Sahara OA imp 1845 to Jarczowce. The strain is Kuhailan and the only direct line from Sahara OA is that from her daughter Sahara Slepka OA who was foaled in transit. Many members of this family perished in World War I and only two mares were saved, Pomponia 1902 and her daughter by Kohejlan OA, Zulejma 1914. After the war Pomponia had two more daughters, Dora 1922 by Bakszysz and Bona 1920 by Mazepa I. Of the postwar daughters, only Dora had any impact on the breed. Mammona 1939 entered the breeding program at Tersk as soon as it was possible and had the mare Nomenklatura by Naseem in 1943. She gave birth to a total of 18 foals, 12 stallions and 6 mares. Five of the mares were used and one of the stallions, Pomeranets by Priboj. Her daughter Monopolia 1956 by Priboj was the dam of *Maritsa by Arax imp Sweden. Monopolia was also the dam of *Monogramma by Knippel, the dam of the stallion Mamluk imp Sweden. *Maritsa was the dam four stallions and four mares. 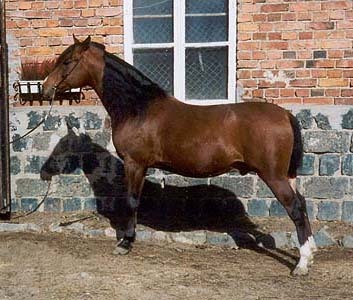 Her daughter *Maricedia by *Cedr was dam of the stallions Maz and Mazur and the mares Marzenie, *Mazurka, Marinka and *Makrela.